Police dogs perform many essential tasks during their service as working dogs in our communities. The general purpose police dog is the type we see most often-a large number of which are German Shepherd Dogs-although other breeds, such as Labradors and Spaniels are used for their scenting abilities to locate drugs, arms and explosives and Dobermanns, Rottweilers and Weimaraners are also used for a variety of purposes. Selection procedures are necessarily rigorous for these animals. Puppies that are bred or chosen for consideration as police dogs are monitored from day one to assess their physical, psychological and mental suitability for the work. Their response to training and different situations is considered at every stage. Police Dog Trainers’ are closely involved with the progress of each potential police dog and handler. The accurate matching of dog to handler, to form a strong working bond, is something that comes with experience. By the age of 10 months, the puppies have been taught basic obedience-such as, sit stay, heel and come-by their handlers, under the supervision of the trainer. They have also worked on the more demanding training tasks of tracking, searching and bite work. The dogs are socialised with other dogs and people and introduced to numerous different situations, sights and noises in a gradual process of confidence-building and temperament assessment. It is not only their ability to carry out set tasks on command that is important, but also their recovery time from potentially stressful situations and reaction to new things, that singles them out as suitable for duty. Bold but not reckless. Police Dog Trainers’ are generally on duty from Monday to Friday, 9am-5pm but they have to remain flexible to meet the demands of their department and a degree of night-training is always expected. No point having a highly-trained response dog that expects to be in its basket all night! Public order situations and assistance with search and rescue operations are just two of the duties they may be called upon to carry out at night. During their early, crucial, training period the animals are inspected by veterinary surgeons and monitored by kennel staff; as well as having their every move assessed by their trainer and handler. At 10 months of age, decisions have to be made about which new recruits will continue to be trained as police dogs. For some, the psychological challenges may be too much to cope with, for others perhaps, the physical demands too much.It is important that the dogs are keen, fit and able to fulfil the role for which they have been selected. For example, during bite training, every dog must chase then bite the padded arm of the trainer; on command only. Each dog must also cease attack on command; immediately and without fail every time. There can be no room for doubt. Dog handlers who work with their section trainers are ‘regular’ police constables first. They may or may not have experience with training dogs-so this involves training the handler and dog together.The importance of the dog/handler bond cannot be over-emphasised. It is a life-long partnership. A police dog may save the life of a handler because they are a finely-tuned partnership who live and work together and have the ability to read each others’ signals. This is as a result of their Trainer’s leadership and support. There are times when it may be necessary for the dog to read a lack of response or signal from the handler as a cue, in order to take appropriate action. Reading non-signals may be as important as reading obvious ones! 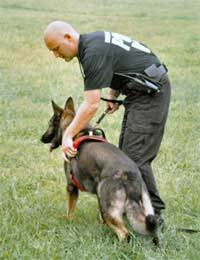 Police Dog Trainers’ are public figures with many roles. Visiting schools and youth centres with the dogs are within their community duties and help young people to realise the work they do. They are regular visitors to rescue centres; where suitable dogs may be selected for training.Public displays of police dog teams are popular events, where the dogs can be seen carrying out some of the behaviours they incorporate into their working lives. No trainer can anticipate what will be required of them, or the dogs, when they go on duty. This is why each partnership, and the team as a whole, must be finely-tuned and stringently trained professionals. I want to be a dog handler when I grow up but I don't know what gcse's took take in year 11 ( im in year 7 going to year 8, 12 years old ) I need help and live in the uk. I would like to know what to do and who can help me, I have connections with people who are dog handlers. Should I ask them? Please see National Careers link here which will give you more information. Also, speaking with your school's careers officer will help and yes, absolutely, if you know people who are dog handlers, they are certainly the best people to ask. Good luck.